Russians may toast with the words “Na zdorovie” — “to your health” — but a new study finds that many Russian men are often literally drinking themselves to death. Russian men who drink three bottles of vodka a week double their risk of dying over the next 20 years, the study shows. It helps explain why Russian men have one of the lowest life expectancies in the world — 64 compared to 76 for U.S. men. “Vodka (or other strong alcoholic drink) is a major cause of death in Russia,” the team of Russian and British researchers report in the Lancet medical journal. But controls meant to limit drinking seem to be helping, they added. 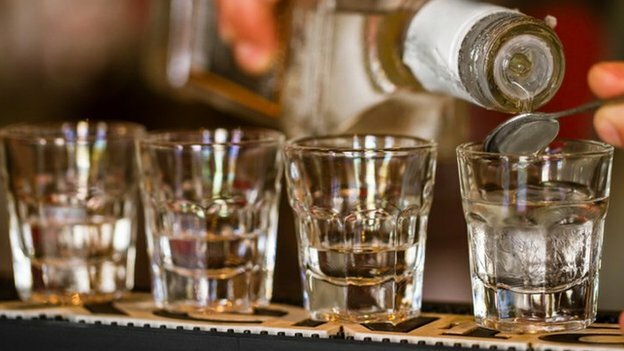 “Russian death rates have fluctuated wildly over the past 30 years as alcohol restrictions and social stability varied under Presidents Gorbachev, Yeltsin, and Putin, and the main thing driving these wild fluctuations in death was vodka,” British cancer expert Richard Peto of the University of Oxford, who worked on the study, said in a statement. David Zaridze of the Russian Cancer Research Center in Moscow and colleagues interviewed 200,000 people in three Siberian cities, Barnaul, Byisk, and Tomsk, over 10 years from 1999 to 2008. These cities reflect the average Russian population, they said. They asked them about drinking habits and health, and then looked to see who died and when. The clearest pattern was among male smokers, who also happened to be the heaviest drinkers. They cleared out anyone who already had some disease when interviewed, and came up with 57,000 men. Men aged 35 to 54 who drank less than a bottle of vodka a week had a 16 percent percent chance of dying of anything over the next 20 years. But this rose to 20 percent for men who drank one to three bottles a week and to 35 percent for those who admitted drinking three or more bottles a week. Most men did drink a bottle or less a week, but 2,842 said they drank three or more bottles every week. “Since 2005, Russian consumption of spirits and male mortality before age 55 years both decreased by about a third but are still substantial,” the researchers noted. Heavy drinking can cause cancer, heart disease, stroke, liver failure and other diseases, and drinkers are more likely to die in acccidents or to be murdered. And people who drink and smoke together raise their disease risk even more. The researchers checked to see if maybe drinking just a little was good for health — other studies in other countries show a few drinks a week can be good for you — but there wasn’t enough data to say if this was true in Russia. Binge-drinking is a problem in the United States, also, although not as bad. The Centers for Disease Control and Prevention estimates that 38 million Americans binge drink, defined as quaffing four or more alcoholic beverages in a single bout. scientists have found that tuberculosis strains in Russia carry mutations that not only make them resistant to antibiotics but also help them spread more effectively. The latest study of TB cases in Russia indicates that rampant drug resistance may not be the only explanation for the TB rise in the region – biological factors also play a major role in it. Researchers at Queen Mary University of London analysed 1,000 genomes from different TB isolates – the largest whole-genome study of a single bacterial species so far. This enabled the team to identify previously unknown mutations linked to antibiotic resistance, as well as “compensatory mutations” that improve the ability of drug-resistant TB to spread. Nearly half of the TB isolates were multi-drug resistant, which means that they were impervious to the two common first-line antibiotics that cure most TB infections. Sixteen percent of these isolates also harboured mutations that made them impervious to “second-line” drugs. These infections are more expensive to treat and patients who receive ineffective drugs are more likely to spread TB, said the research published in the journal Nature Genetics. 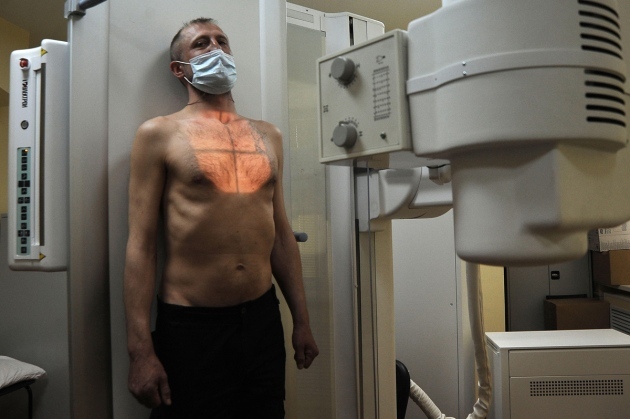 TB, which is caused by the bacterium Mycobacterium tuberculosis, exploded in Russia and other former Soviet nations in the early 1990s, after the collapse of the Soviet Union and its health system. “It certainly adds an extra layer of worry, because one had assumed if you could solve ‘programmatic’ weaknesses, you would solve the problem of the drug-resistant TB,” stressed Francis Drobniewski, a microbiologist at Queen Mary University. “Although we know the general story of TB drug resistance in Russia, these new findings are still shocking,” added Christopher Dye, an epidemiologist at the World Health Organisation (WHO) in Geneva. According to Megan Murray, an epidemiologist at the Harvard School of Public Health in Boston, Massachusetts, the worst scenario is that the organisms are developing resistance, compensating for it, and evolving into something that’s new and different, that’s much less treatable. Rising costs and long waits for quality healthcare are pushing millions of people each year into medical tourism. In the developed world, healthcare forms a significant part of a country’s economy. According to the U.S. Census Bureau, the annual revenue of that country’s industry in 2012 was roughly $1.688 trillion. World Bank figures show that public health expenditures in the European Union could jump to 14 percent of GDP in 2030, from 8 percent in 2000. By traveling in search of quality at a lower price, medical tourists seek alternatives to their own countries’ healthcare offerings. Depending on the destination and treatment, a medical vacation can cost 50, 30 or even 10 percent of what patients would pay at home. The number of wealthy Russians traveling abroad for treatment is making the trend especially noticeable. “At the moment, there are roughly 200,000 Russians traveling for medical purposes each year, and they leave approximately $2.5 billion during their stays,” said Alexei Kamenev, president of the First All-Russian Association of Private Medical Practitioners, in his opening speech at last week’s Medical and Health Tourism Mart in Moscow. The meeting is the first-ever direct sales platform set up in the global medical and health tourism industry. Israel is Russian health tourists’ favorite destination, Kamenev said, with 50,000 traveling there in 2012 – doubling the amount in 2011 and contributing more than $1 billion to the country’s economy. He outlined three main groups of people who seek medical treatment abroad. The first strand travels from countries with less developed healthcare systems to more developed ones, for example from Russia to Israel or Germany. The second strand is citizens of countries with good but expensive healthcare going to places with high quality but more budget-friendly options, such as Americans traveling to Asia. The third strand looks for alternative medicine in locations such as Tibet because mainstream treatments have proven insufficient. Countries that are just emerging onto Russian tourists’ radar were also present at the event, hoping to crack the Russian market – such as Spain. Hungary is already popular for some Western European patients, especially for dentistry, plastic surgery and its world-famous thermal baths and spas, but Angelina Strizhkova, the director of the Prestige Haz hotel and spa in the western city of Heviz, lamented that it has little advertising on the Russian market. The growing popularity, though, has given rise to several problems, Kamenev told The Moscow News – such as middlemen, who he said are making heavy profits off of Russian patients. His organization is attempting to make the industry more transparent and consumer-oriented by creating a new international online platform called MedOkey, comprised of some of the most prominent doctors and clinics worldwide. It is set to start work at the end of the year. A single flow of Russian patients through accredited international agents will help “remove all profiteering and non-medical components from the industry,” Kamenev said, by displaying comprehensive price lists, thus putting middlemen out of business. MedOkey already has the backing of the World Health Organization and the World Medical Association. Kamenev has also been in negotiations with Israel to allow Russian citizens to use their public healthcare services, reaching agreement on a 10 percent quota that he believes will save thousands of lives. Kamenev’s organization has also agreed with Israel on a deal whereby Russian doctors can visit on educational exchanges, to learn about advanced technologies that Russia does not yet have and eventually improve domestic care. Approximately 90 percent of Russia’s top medical facilities and doctors are located in Moscow, where only 10 percent of the population lives. Russia’s experience with medical tourism, Kamenev believes, will allow it to try to apply international best practices at home. A glimpse of this future comes from RZD Zdorovye, a subsidiary of state rail monopoly RZD, which has a chain of spas, medical resorts and sanatoriums throughout the country. The company’s Daria Sokolova and Dmitry Mishin said that many of its doctors have trained abroad, including in traditional Chinese medicine, and that its sanatoriums have attracted some patients from Western Europe and North America. One benefit of domestic medical tourism is lower prices, because they include travel, accommodation and treatments, Mishin said. In Israel, for example, only consultation costs are included. Even the lack of a language barrier brings the price down, and a cultural sympathy can make treatments more effective. “Russian doctors understand the specifics of our mentality and our illnesses, so we treat what needs to be treated, avoiding losing things in translation,” Sokolova said.